One of Ireland’s best-loved writers makes his first appearance at the Irish Literary Society. Doyle joins us in conversation on his books, films, educational work and his forthcoming novel, Smile. It tells the captivating story of Victor Forde, for whom a chance meeting in a pub conjures up long-buried childhood memories – and it’s a book about how we all struggle to accommodate our past selves. There is not a writer currently working in the English language who can match Doyle for the fluency with which he tacks back and forth between the hilarious and the heartbreaking. A chance meeting with an old school friend leads his protagonist on a journey back to being taught by Christian Brothers. Smile has all the features for which Doyle has become famous: the razor-sharp dialogue, the humour, the superb evocation of childhood – but this is a novel unlike any he has written before. Just moved in to a new apartment, alone for the first time in years, Victor Forde goes every evening to Donnelly’s pub for a pint, a slow one. One evening his drink is interrupted. A man in shorts and pink shirt brings over his pint and sits down. He seems to know Victor’s name and to remember him from school. Says his name is Fitzpatrick. Victor dislikes him on sight, dislikes too the memories that Fitzpatrick stirs up of five years being taught by the Christian Brothers. He prompts other memories too – of Rachel, his beautiful wife who became a celebrity, and of Victor’s own small claim to fame, as the man who says the unsayable on the radio. But it’s the memories of school, and of one particular Brother, that he cannot control and which eventually threaten to destroy his sanity. Doyle will be in conversation with Gavin Clarke. 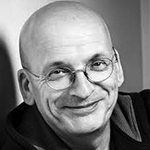 Roddy Doyle was born in Dublin in 1958 and grew up in Kilbarrack. After graduating from University College Dublin he spent several years as an English and geography teacher before becoming a full-time writer. His novel Paddy Clarke Ha Ha Ha won the Booker Prize in 1993. Several of his novels, including The Commitments and The Snapper have been successfully adapted into films. Doyle’s work is set primarily in Ireland, especially working-class Dublin. Inspired by David Eggers’ 826 Valencia, he co-founded the children’s writing charity Fighting Words. Doyle has also written many novels for children, including the Rover Adventures series. He has also written many short stories, several of which have been published in The New Yorker. In 2016, he translated Mozart’s Don Giovanni for the Opera Theatre Company. The stage version of The Commitments, adapted by Doyle, opened in London’s Palace Theatre in 2013 and toured Britain and Ireland until May 2016.